Black Swan: Just ‘a rare bird in the land’? Home → Black Swan: Just ‘a rare bird in the land’? I love any swan, but black swans hold a special place in my heart. They are the reason I found my way back to writing. That aside, they also symbolize, at least to me, that what at first appears impossible, could very soon become a reality. The latin phrase became a proverb in many western languages including English. We’ve all heard “a rare bird.” However, that used to mean rare as in non-existent! While this ancient phrase still permeates our culture – as in rare means rare – to our great great greats, a rare bird had a different meaning. A black swan in western civilization was a metaphor for that which COULD NOT EXIST. Can you imagine the look on some European sailor’s face when lo and behold, they spotted the mythical black swan? Floating like a mirage, the ebony flock was spotted off the west coast of Australia in the late 17th century. 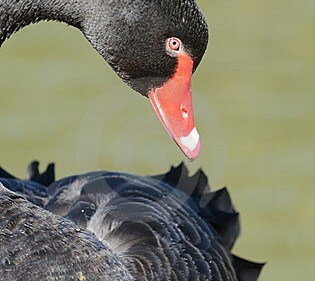 Not until the 18th century, did westerners come to believe the black swan real. And with their discovery, the metaphor shifted. The “rare bird in the land” then became synonymous with something of beauty which was PREVIOUSLY THOUGHT IMPOSSIBLE. Isn’t that a transformational symbol speaking of swans? The white swans’ primary symbol is transformation. And transformation is the sign of our current times. There is much more to our world, than our five senses, even six senses can sense. But the greatest of these, is our sense of wonder. In a nutshell, the black swan is my personal symbol for connecting to the divine muse, and the many evolutionary mysteries still yet to be discovered, in ourselves, our potential as a species, and our beautiful Earth and universe.